Wigton Windfarm, one of three preferred bidders selected by the Office of Utilities Regulation (OUR) for the supply of 115 MW electricity generating capacity from renewable energy sources, has submitted its 1% bid bond and is moving quickly to implement plans for the construction of its 24 MW wind energy plant. Wigton will begin negotiations with suppliers in short order and then move to the engineering, design and construction phase of the venture. The company anticipates that the project will be executed well within the timelines specified by the OUR which stipulate that construction should start by August 2014 with commissioning by August 2015. Project implementation is expected to create as many as 125 jobs during the construction phase and three permanent positions for engineers after commissioning. The new facility, Wigton III, will be located in Rose Hill, Manchester on lands adjoining the company’s 38.7 MW wind farm complex. Projected plant output is 63,072 MWh per year which should reduce national oil consumption by more than 37,100 barrels annually and result in yearly savings of approximately J$400 million. Wigton III will increase renewable energy input to the national grid from 7.5% to nearly 10%, (without factoring in any other new projects). The clean energy facility will also reduce greenhouse gas pollution, an adverse effect of traditional fossil fuel generating plants. “We are very pleased to have been selected as one of the preferred bidders and our attention is now focused on the implementation of our plans,” said Wigton’s Chairman, Ian Kelly. “One of the goals of the National Energy Policy is for Jamaica to get at least 20% of its energy supply from renewables by 2030 and now Wigton will play an even more active role in the achievement of this goal,” he added. 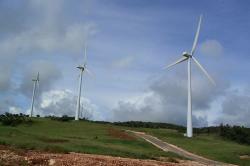 Wigton Windfarm began operating in 2004 with a 20.7MW wind generating facility. In 2010, Wigton II was commissioned providing 18MW of additional capacity. In its nine years of operating the wind farm reduced Jamaica’s oil consumption by almost 335,000 barrels resulting in savings of approximately J$2.2 billion.